Ingrid Schoeman had tuberculosis – and suffered traumatic side effects from her TB medication. Running helped restore her health. Recently, Health Minister Aaron Motsoaledi released a video to raise awareness about tuberculosis and support the TB Proof #UnmaskStigma campaign. TB Proof is an organisation that advocates for safe and effective treatment for South African TB survivors. He wore a white mask emblazoned with the words ‘Zero Stigma’, to symbolise the unmasking of the shame associated with the disease. The high-profile politician’s sentiments are echoed by Ingrid Schoeman, an activist for TB Proof who survived traumatic side effects from the medication she was given to treat drug-resistant TB: liver failure, a coma, and damage to the peripheral nerves in her feet. “When I came out of hospital after 75 days, my feet looked like a baby’s; soft, as though they’d never walked on anything before,” recalls the Pretoria 32-year-old. “I struggled to wear shoes, and when my feet touched carpet, they burned as though an electric current was passing through them. But Ingrid is grateful for the suffering she endured with TB, as she can now relate to others in South Africa who get sick and suffer because of it. And because of the shame that surrounds TB, it’s seldom talked about. While it’s true that people with immune-suppressive diseases such as HIV and diabetes are more at risk of contracting TB, so are children and pregnant woman. Healthcare workers are six times more likely to be hospitalised for drug-resistant TB than the general population. TB spreads through the air, so anyone can get it. “I knew something was wrong, so I visited the doctor,” says Schoeman. “A chest X-ray revealed a small black spot, but they didn’t know what it was. Four days later, the spot had deteriorated so much that they suspected it was double-lobe pneumonia. Schoeman was admitted to hospital on 5 February 2012; little did she know she was to spend the next two and a half months there. Three weeks in, the treatment she was taking caused her liver to fail, and she fell into a coma. She was in ICU for about a month. Bedridden, she lost her independence. She had a tube stuck in her nose and another in her stomach, as well as a drain in her chest; and her arms were blue, because nurses drew blood from them every day to check her electrolytes. When she saw them arriving to draw blood, she would already be in tears at the thought of how much it was going to hurt. Schoeman found herself in other situations she would never have imagined: she would brush her teeth and spit into a plastic bowl, only to vomit into the same bowl minutes later, when the medication made her feel nauseous. Nurses would have to roll her over and tell her to hold onto a bar while they washed her, as she was too weak to sit up or get out of bed. It wasn’t all bad. Schoeman remembers the kindness of strangers; and of her physician, Dr Stickells, who would sit with her and empathise. Once, one of the nurses washed Schoeman with scented soap instead of the usual alcohol solution, telling her she wanted her to feel nice for a change. They also sang with her, and played music. There was humour, too. 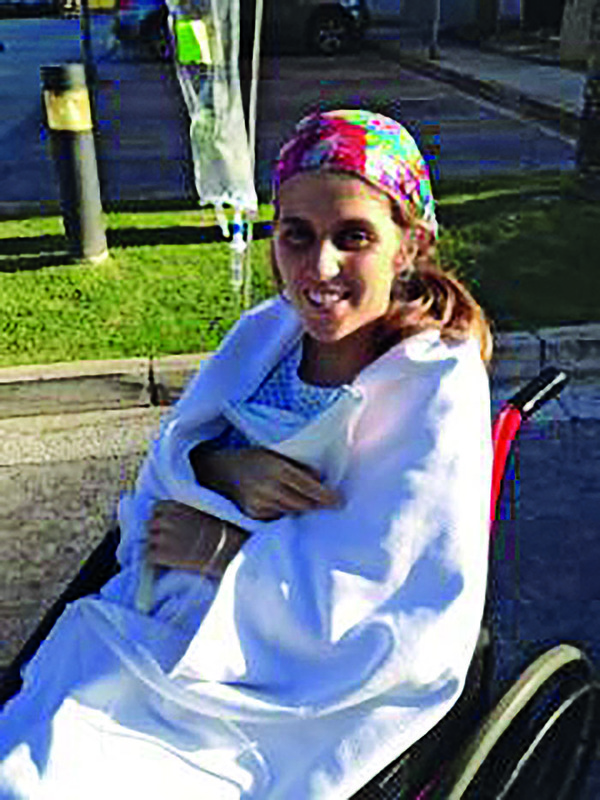 “What’s up, Eight Months?” the nurses would tease affectionately – when Schoeman’s liver failed, her stomach retained fluid and was very swollen, which gave the impression she was heavily pregnant. Schoeman’s family visited her in hospital, as did her friends. They told her about work and made her laugh, and she fondly remembers they once brought her Easter eggs. Schoeman had been bedridden for so long, she left hospital weighing around 40kg; and the muscles on the tops of her feet were so weak, she couldn’t walk properly. Foot cramps would wake her during the night, forcing her to stand up or rub her feet. She did manage to go on holiday. But because she couldn’t walk upstairs to the restaurant at her hotel, her meals had to be brought down to her on the ground floor. Once, she slipped and fell by the side of the pool, and onlookers stared as she tried – and failed – to get up again. It was humiliating. For a while after that, Schoeman walked more slowly, her back hunched, always looking down at her feet, afraid of falling. “It’s important that when you’re going through a tough time, there are people who love you and give you hope that things are going to be okay – at the same making you laugh and realise that there is lots of fun to be had in life,” Schoeman says now. Luckily, she had just such a support system. Once a week, she would stay with her family; they would cook together and enjoy nature, and she felt she could be herself. She’s the youngest of three, and playing with her sisters’ kids provided a much-needed, fun-filled escape from reality. A physio began to help Schoeman with basic exercises – using resistance bands, lifting the front part of her foot. She started swimming with a group of women, too; she jokes that they were at least 50 years older than her she was, but the sessions became the highlight of her week. When Schoeman finished her TB treatment and took medication to relieve the pain in her feet, her health returned, and her quality of life improved dramatically. She was still aware she had TB, but she no longer felt limited. Now, she felt free. 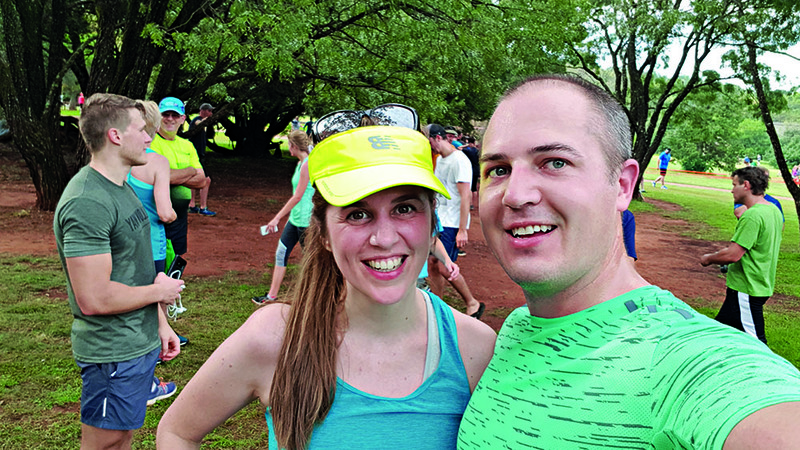 Schoeman’s time in hospital had been a painful reminder that having time on your side isn’t always guaranteed, because your life can change in an instant. She’d also thought about all the things she still wanted to do. She’d been inspired by her dad, a Comrades finisher, and her mom, who also enjoys being active. Surviving a coma had helped her find the confidence she needed to take up running herself. She joined the BestMed Madibaz running club in PE; and running, in turn, increased her self-confidence. Now based in Pretoria, Schoeman runs six times a week, and has finished four half marathons. Though she confesses she’s no hundred-metre sprinter, she pushes herself to run long distances on the trail, because it gives her the sense of freedom, of moving forwards, that she longed for when her world shrank to the size of a hospital bed. Campaigning for better treatment options for TB sufferers, Schoeman believes, will prevent others experiencing the same trauma she did, and so many other South Africans still do. Sharing her story, she encourages people who experience the early warning signs of the disease – a cough, night sweats, fever, unexplained weight loss – not to feel ashamed about seeking treatment, so that they don’t infect their families or the broader community with this airborne disease. When Schoeman travels to speak about her experiences, she takes her running shoes. To her, running through a new place mirrors her triumph over TB, and she notices things she might have missed before. “Even if the going is slow, I enjoy feeling free and physically able to be active and outdoors,” she says. I vow not to walk; because I never want to forget how it felt to want to walk when I couldn’t. Schoeman is an inspiring example to all who doubt they can run; because if someone who started off in a coma can become a runner, what’s stopping you? For more information, visit tbproof.org.